Decorative mouldings add style and character to a home. The lightweight mouldings supplied by the Finishing Touch make it easier to add decorative house mouldings to a build or home renovation. The decorative architectural mouldings are manufactured from computer cut high grade EPS polystyrene, triple coated with a multi-part compound then reinforced with a triple coating of sand for maximum strength and durability, producing a moulding that will not crack, shrink, expand or bend. This process takes about five days from order and installation is very simple and quick. Several properties are currently under development and the Finishing Touch are busy getting ready to begin manufacture. The first property is in Bentleigh East and is a 50 square home in the French Provincial style. The house will have a dorma window (oval window on the roof), keystones, seven arches, window architraves, window sills and parapet mouldings, all helping to create the unique French Provincial look that has become so popular. The next is a post-modern, two storey building making up two units that are fifty squares in total. This property will use eave mouldings, French Provincial window arches, window sills and a large French Provincial parapet with a French Provincial stringer to suit. Five arches in each unit above the windows will add a highly decorative finish to the build. And a single storey, post-modern, thirty five squares home in Yarrambat will be beautifully finished with decorative mouldings. This build will be enhanced by French Provincial parapets, a large keystone above the entrance, stringer mouldings, window architraves and window sills. A French provincial style two storey, fifty square home in A.I.F. 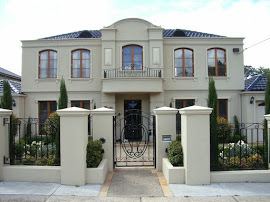 Street, Balwyn is now having it’s fencing finished to match the French provincial style of the house. The Finishing Touch was chosen to match up pier caps and wall capping to the decorative mouldings on the house that were supplied by another company. The reason the Finishing Touch were selected to supply the current lightweight mouldings was due to their ability to manufacture and install in a timely manner along with the quality and longevity of their mouldings. Another home in Brighton East has been beautifully finished with the addition of decorative mouldings. The two storey, fifty square, modern design home in Meyer Court has had quality, lightweight parapet mouldings, flatband mouldings and window sills manufactured and installed by The Finishing Touch. With a seven year warranty the owners can rest assured these mouldings are built to last! Two new projects are currently under development. One is for a sixty square, double storey, post-modern home at Elllamatta Rise in Ringwood North. This build requires the addition of decorative mouldings to enhance the overall design of the home with window architraves, window sills, parapet mouldings, stringer mouldings and quoinings. The other project is at 35 Jeffrey Street, Lower Templestowe. The forty square, double storey post-modern home will be enhanced by decorative parapet mouldings, stringer mouldings, window architraves, window sills, and nicely finished with pier caps on the fencing. The lightweight mouldings supplied by The Finishing Touch are easy to handle and install and can be manufactured within several weeks. Decorative mouldings make it easy to create the French Provincial look, which is a popular style for houses built in Australia. This highly desirable style was recently achieved on a two storey, fifty square home at Sidgewick Street, Atwood. The house was superbly finished with decorative mouldings supplied by The Finishing Touch. They manufactured and installed parapets for upper and lower storeys with quoinings, a decorative arch over the balcony entrance and window architraves with a flatband extending around the circumference of the house. Another house is styled in the French Provincial look in Nicholson Avenue, Mount Waverley. Decorative mouldings have helped to create a stunning finish to this double storey, sixty square house. The Finishing Touch supplied the mouldings, including a large eave parapet 300mm x 300mm, decorative keystones above the windows, five arches over the windows along with window architraves, a French Provincial style parapet moulding separating the first floor and ground floor, garage mouldings and architraves around the entrance. Decorative mouldings can be used for many other styles also, such as Georgian, Mediterranean, Art Deco and Post-modern. A two storey, sixty square home In Stafford Court, Wendouree has been built in a post-modern design. The decorative mouldings have helped to create a nicely stylised finish, with parapet mouldings between the top and ground floors, window architraves, window sills and quoinings. The Finishing Touch supply many styles of homes with suitable, long lasting, high quality decorative mouldings with a fast turnaround from time of ordering to installation. A 50 squares post-modern design house at 145 Haverbrack Drive in Mulgrave, Victoria will achieve a stunning finish with the addition of top quality Parapet mouldings, Stringer mouldings, Window Architraves, Window Sills and Quoinings. French Provincial style homes are very popular in France, the U.S.A. and Australia. The use of mouldings greatly enhances and helps to achieve this look. 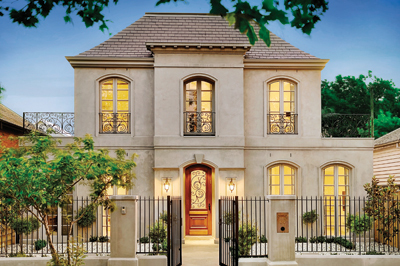 A 50 square home situated at 101 Balaclava Road, Caulfield North is being built in the French Provincial style. This house, in a very prominent location, will be built in the French Provincial style but without a pitched roof. The addition of Parapet mouldings and Window Architraves will help create the desired style. Another, larger home at 60 squares, is also being built after the French Provincial style at 243 Porter Street, Templestowe. The use of mouldings will create a distinctive statement and add flair to this home, with Parapet Eave mouldings, French Provincial Window Architraves, French Provincial Window Sills, Parapet Mouldings, Stringer Mouldings and Quoinings. At the Finishing Touch factory manufacture is starting on mouldings in preparation for site delivery to a build in Warren Heap, Ballarat. A thirty square, single storey house at Orchard Lane will be have a distinctive finish with the addition of Window Architraves and Window Sill mouldings. The decorative mouldings will be installed within a month.